This map is updated regularly by the Oklahoma Water Resources Board. The Oklahoma Forestry Services' Current Burn Bans map indicates the counties that have declared a burn ban, as well as bans declared by the Governor. The county and dates for which the ban is valid are listed beneath the map. 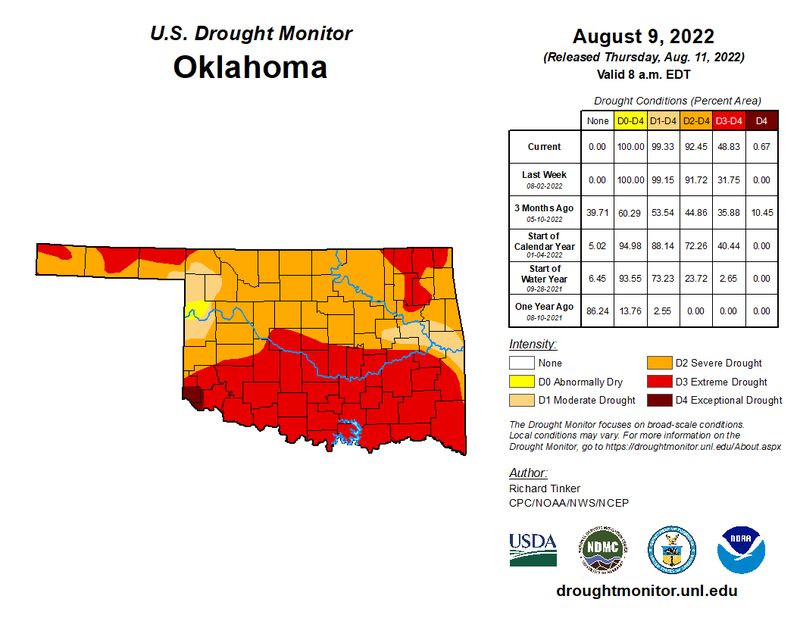 The map displays weekly drought conditions, as designated by experts including climatologists at the Oklahoma Climatological Survey. The data cutoff for Drought Monitor maps is Tuesday at 7 a.m. Eastern Standard Time. The maps, which are based on analysis of the data, are released each Thursday at 8:30 a.m. Eastern Time. Information for the impact report database comes from a variety of sources: on-line news stories, members of the public who submit a drought-related impact for their region (see Add A Drought Impact), members of the media, and members of government agencies. This Oklahoma Map displays the number of consecutive days an area has experienced less than 0.10 inches of rain. The values lead up to the current date. This Oklahoma Map displays the number of consecutive days an area has experienced less than 0.25 inches of rain. The values lead up to the current date. The Oklahoma Keetch-Byram Drought Index illustrates the probability of wildfires based on drought and soil moisture conditions throughout Oklahoma for the current day. It ranges from 0 (no drought) to 800 (extreme drought). The Flood and High Flow map produced by USGS shows the location of streamgages where the water level is currently at or above flood stage, or at high flow. The high flow conditions are expressed as percentiles that compare the current immediate flow value to historical daily average flow values for all days of the year. Map of real-time streamflow compared to historical streamflow for the day of the year. Departure from Normal Streamflow from the USGS provides detailed drought information. A map of your chosen state shows areas that have experienced below normal streamflow (in percentile classifications) based on a historical seven day average for that particular day. Every month, the Oklahoma Water Resources Bulletin produces a summary on Oklahoma's current conditions. Precipitation, soil moisture, drought indices, a weather/drought forecast, a crop report, reservoir storage, and streamflow conditions are included. The Crop Progress and Condition Report includes degree days, air temperature, precipitation, crop planting progress, crop development and harvesting progress. This report is published weekly except for the winter months of December, January and February, when issued monthly. VegDRI maps are produced every two weeks and provide regional to sub-county scale information about drought's effects on vegetation. The VegDRI calculations integrate satellite-based observations of vegetation conditions, climate data, and other biophysical information such as land cover/land use type, soil characteristics, and ecological setting. 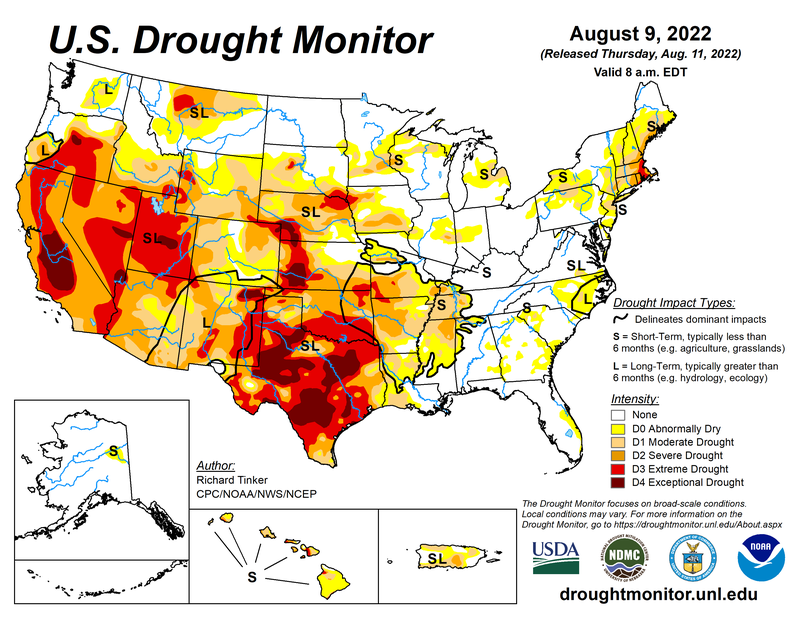 The National Drought Mitigation Center produces VegDRI in collaboration with the US Geological Survey, and the High Plains Regional Climate Center, with sponsorship from the US Department of Agriculture. The U.S. Drought Portal provides current drought information, impacts, forecasts, and reports by state or region, along with supplemental tools to aid in education, planning, recovery, and research. The U.S. Army Corps maintains a daily report of reservoir conditions for each Oklahoma Basin.